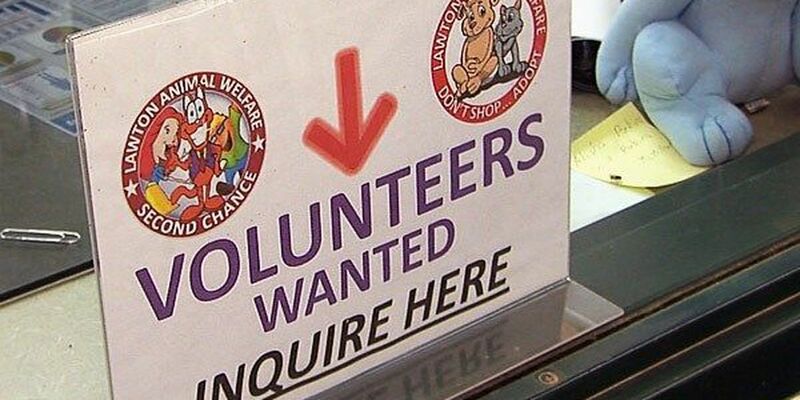 LAWTON, Okla._Lawton Animal Welfare recently achieved a 'no kill' status, a goal they've been working toward for the past year. Without the help of volunteers, some of whom show up daily, that status would not have been made possible. Shelter organizers say it's those volunteers that help give them an extraordinary reach simply by donating a few hours, or minutes, of their time. He doesn't have a forever home just yet, but while he waits, animal shelter volunteer Marsha Loviscek, with her daily visits and walks, makes sure Christian, as she's so lovingly named him, isn't without hope or love. Loviscek started volunteering at the shelter eight months ago when the shelter was under fire, following allegations of neglect. "I decided to come down myself and just evaluate it, and I decided that I was going to be a part of the solution, not the problem," Loviscek said. She says the animal's long for a companion and she's happy to fill that role, even if it's just for a few minutes or hours a day. It's all time she says is well spent. "To actually be at an adoption event and see them go home with their parents, oh my gosh, you just want to cry. Your heart just fills with joy over it, it really does," Loviscek said. Shelter volunteer coordinator Mo Curran says when man's best friend is without its man, it can take a toll on the animal. She says that's when volunteers are needed the most, helping to restore the animal's trust and spirit. "We had one, she was a little nervous in the shelter and one of our newest volunteers, she brought her out and she sat probably a good our two or three days prior to the event, and by the time the event was ready she was a different dog. She was greeting people! She wound up getting adopted, so it helps bring them out of their shells," Curran said. If a picture is worth a thousand words, "It's one when someone sees they're going to be like 'oh I need that dog in my life,'" volunteer photographer and professional animal trainer Wendy Ewing said. Ewing says these animals only need their pictures to be worth two; adopt me. "That's my goal every time I take pictures. I make sure there's one on there that's going to grab someone's heart strings and want to take them home with them," Ewing said. The pictures she takes of them end up on their kennels or PetFinder.com. She says it's not always an easy job, especially if her client is camera shy. "With people, you can tell them to stay and they'll stay. With animals, especially here, you don't know if they'll be able to, so you have to interact and play with them so they'll stay in the shot. It's challenging," Ewing said. More than a dozen volunteers donate their time each week. They invite more to join, and say it a decision you won't regret. "Please come down. By all means, help. You just have to teach them, they are very intelligent and if you take the time to teach them they're your best friends," Loviscek said. Anyone 13 years or older can volunteer to walk, interact, or photograph any of the animals. The shelter says you determine how much or how little time you want to devote. For more information you can call 580-581-3218.